Can your pets make breakfast? I’ve been trying to pay extra attention to Rosie lately. I love the way she absolutely lights up when I teach her something new. She’s big on learning how to do things all by herself lately. Sleep in her own bed? Check. Open her own granola bars and string cheese wrappers? Mhm, and open everyone elses’ for them as well. Wipe her own bum? Sometimes yes, sometimes no. Dress herself in clothes she selects? Oh, multiple times a day. Brush her own teeth and hair? Yep. Accessorize? Oh my goodness, the lip gloss and stick on earrings and bows and headbands and play jewelery…Rosie is very girly even though I am not, it just seems to naturally be her thing. Her latest independent streak has been focused on making breakfast herself. We go out and collect eggs together, if there are any. The Feathered Ladies have stopped laying this past week. Inside, I turn on the burner and she waits for the cast iron skillet to get hot enough, then adds some butter and smooths it across the pan. She waits for the butter to sizzle and brown a bit, so it’s hot enough for the eggs not to stick. 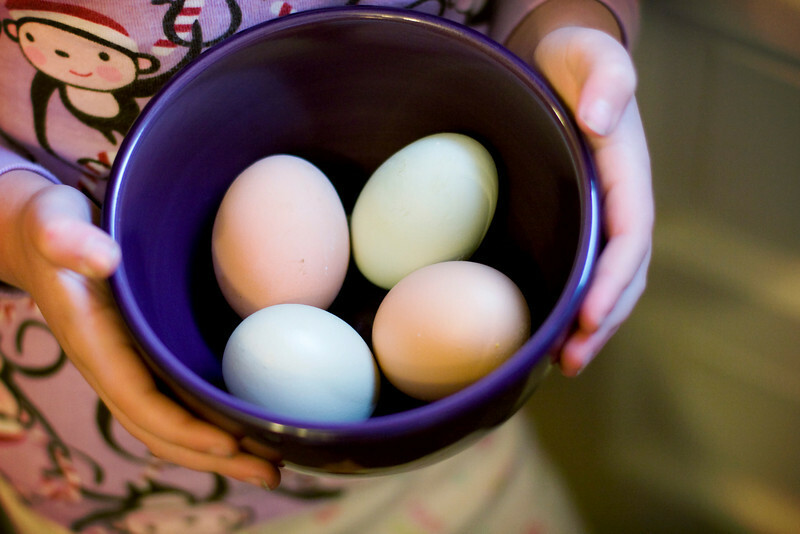 She selects our eggs with glee, assigning a different color to each person. Then she cracks each egg in a bowl by herself, scrambles them or not depending on what each person wants, and then dumps them into the pan. She flips the eggs, puts them on the plate when they’re done, and she is so very proud. Today at lunch she informed us that she is an adult because, you know, she can cook eggs all by herself now. I’ve decided it doesn’t have to be perfect, but it should be the best we can do with what we are given. Sometimes I am too tired to function. I guess it’s ok if I am not always a perfect parent, as long as I am doing the best I can with that particular day. Tomorrow will be a new day. Spring is coming. There’s only the rest of January and then all of February to get through. Then it will be March, and slowly warmer weather will return. I’m not a fan of winter. It’s boring being trapped in the house. I don’t particularly like snow either, but there it is…it’s supposed to snow 1-3 inches on Thursday night. Yuck. I’m looking forward to spring. Spring is a time of rebirth and renewal. I’m going to get back to living like I want to instead of moping around in a sleepy daze! Ada will sleep better after spending hours outside playing in the fresh air. Rosie will sleep better too, without cabin fever. And you know, Ada will have her first birthday in April. Can you believe it’s so close? I want to TTC again this summer, maybe…! Next story No Poo, No More.